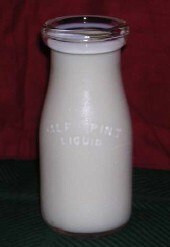 Note: About 1985, Howard Stratton gave each of his children a half-pint milk/cream bottle and bottlecap, which were accompanied by this account. While cleaning out Stratton Mill following the death of the last miller, several of these milk/cream bottles were found still in the box of the original manufacturer. Several of these bottles are used in Stratton House Inn, and a small number are available for purchase from the Stratton Mill Foundation. These bottles are about 5-inches high. The small milk bottle with this story [see note above] is reminiscent of the days when our milk was sold raw (un-pasteurized) and not homogenized, so the cream would rise and show clearly how much butterfat was in the milk. In the summer when the cows had green grass, the cream would be a richer color than in the winter. Our Jersey cows, and later also Guernseys too, had butterfat of over 4.5%, usually over 5%. After the losses of the 1930s to Bangs, we maintained Tuberculin- and Bangs-free herds.